The white grape (also bag vine) may come from the chewing bush. It was built in 1945 by the owner of the winery Görz in Bad Kreuznach ( Rheinland-Pfalz ) allegedly from the causeway Germany introduced. It spread under the name Beutelrebe on a small scale at the Nahe. The variety was then selected by the breeder Georg Dalkowsky and approved in 1982 under its current name. For a long time, the parenting was controversial, including Riesling x Green Valtellina or mutation of the Riesling. 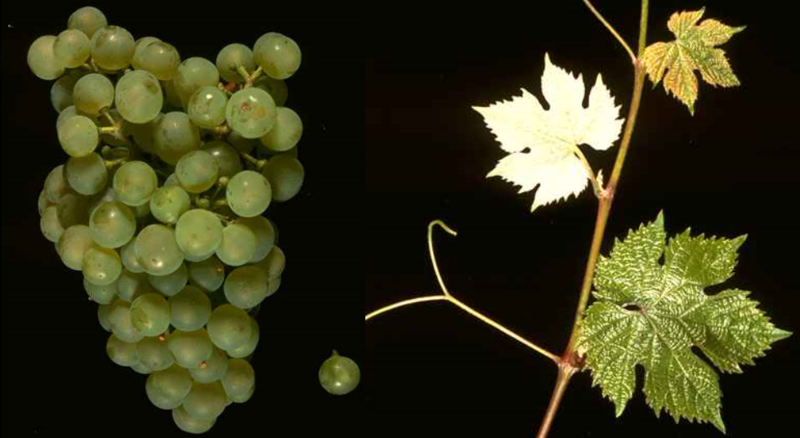 According to done in 2012 DNA analysis but it is a cross between Madeleine Angevine x Riesling, The late ripening vine is resistant to wintry frost, It produces an acidified, Riesling-like wine. The variety is in Germany in the growing areas Near and Rheinhessen grown. grown. In 2010, however, no stock was reported (Kym Anderson ). This page was last modified at 11 October 2018 at 14:31.